CityEconomist Update: U.S. DEBT | Debt-Ceiling Chicken Again? Suggestions for the trillion-dollar coin. There is nothing in the U.S. Constitution about a debt ceiling. The President paying debts of the U.S. Government (especially see 14th Amendment, Section 4). 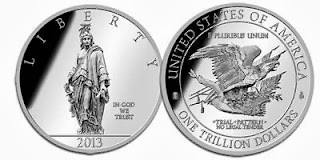 If the Tea Party faction in the House wants again to play chicken over the budget and the debt ceiling, and put into question the payment of interest on previously issued, supposedly "risk-free" U.S. government bonds, it is time to resurrect the trillion-dollar coin idea. Sure, the Tea Party will go nuts. But the debt-ceiling debate is about whether Congress will provide the money for debts already issued. If the idea of an experimental default on U.S. debt gets support in Congress, "No, the financial markets won't go apocalyptic," says one newsletter (I paraphrase). "It will be worse than that." Financial panics are no fun. Ask those who were involved in the Lehman-bankruptcy days of five years ago, or look at the effects of the widespread bank panics of 1932-33. It took FDR and his Republican Treasury Secretary, Will Woodin, months to quell the panic and it took two new agencies (the FDIC and the SEC) to fix the financial system for the next half-century. Secretary Woodin had language inserted in the bill outlawing private ownership of gold. The language allowed ownership of high-value gold coins to be inserted in the legislation that ended (until Nixon and the freeing of the market for gold) Americans' right to own gold. 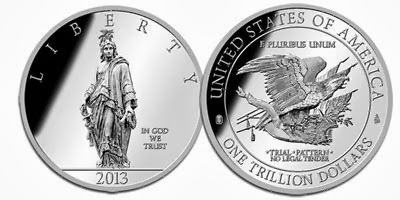 A subsequent law updates this law to allow the Treasury to mint platinum (palladium) coins of any denomination. The language seems well suited to minting a special trillion-dollar coin that the Treasury would deposit with the Federal Reserve. A last resort.